The Lithuanian team celebrating their outstanding win. a nail-biting semi-finals win against Serbia (67:66), the Lithuanians demonstrated their mastery of the game by winning 90:61 in the finals against the other semi-finalist Russia. The finals drew a crowd of 13,000, which was an all time record for Youth Basketball games in Europe. The Bronze went to Latvia. 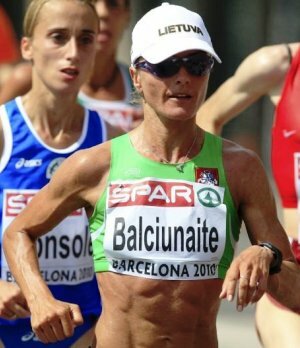 Another outstanding result was the win by Lithuaniaā€™s Å½ivilÄ— BalÄ¨iÅ«naitÄ— on July 31 2010 in the Women's Marathon in the 2010 European Athletics Championships, held in Barcelona, Spain. BalÄ¨iÅ«naitÄ—ā€™s time was 2:31:14. More than a minute behind Å½ivilÄ— was Russiaā€™s Nailya Yulamanova in second place with 2:32:15. Italyā€™s Anna Incerti took third place with 2:32:48.